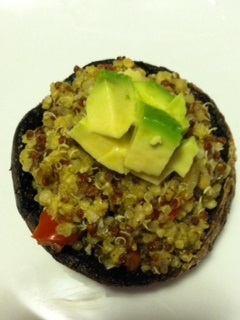 This post is about the delicious stuffed portobello mushrooms I made. The pesto gave the quinoa a rich flavor, while the avocado added a buttery texture to the dish. 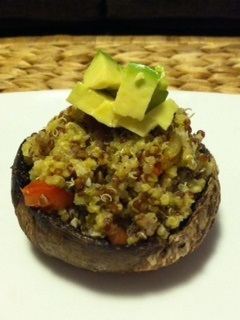 The quinoa complemented the flavor of the filling mushrooms. Read on for a recipe which promises not to disappoint (unlike my fashion sense or spelling skills, which let me down fairly often). 1- Add the quinoa and water to a pot. I set the heat to medium and waited until the water was boiling before turning the heat down to medium-low and letting the quinoa simmer for about 20 minutes until the water was absorbed. 2- While you are waiting for the quinoa to finish and after it has been cooking for about 10 minutes, then add olive oil to a frying pan and let it heat over medium heat. Add the mushrooms when the pan is hot. Sprinkle the spices on as the mushrooms begin to cook. Turn them when they start to brown on one side (about 5-7 minutes). Let them cook for another 5-7 minutes on the other side. Take them off the heat when they’re tender. 3- Add all of the rest of the ingredients to the quinoa when it is finished. Stir it and let it sit to let the flavors combine. 4- When all layers are finished and prepped, start by placing all of your mushrooms with the tops facing down. Fill each with quinoa mixture and finally top with the extra avocado pieces (if desired). Serve immediately. Enjoy! Ooh pesto quinoa sounds amazing!! Thank you! They were tasty!